Why Is The Chromatic Scale So Important To Guitar Players? 1 simple and effective way to memorize the seven notes of the musical alphabet (A, B, C, D, E, F, G). So you can quickly read music and guitar tabs. How to memorize the 12 notes of the chromatic scale using the 6th string. So you can visualize the fretboard and always find the right note. How to play the same note on multiple strings, so can play freely across the fretboard and avoid getting "stuck". Find out the crucial difference between the pentatonic (5 notes) and diatonic (7 notes) scales, and when it’s best to use each one. 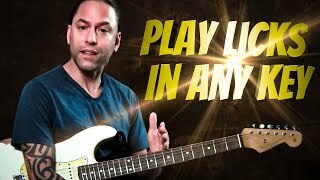 How to play the major scale in any key, starting on any note, from anywhere on the fretboard… without hesitating. Discover the most important key signatures for guitar (and which ones you can ignore), so you don’t waste time practicing things that don’t help you. Discover what makes a chord major, minor or diminished, so you’ll know which chord to use in any playing situation. How every chord is made up of at least 3 notes. Which means, you’ll be able to play chords anywhere on the fretboard. How to master interval shapes on the fretboard, so you can create ANY chord you want from scratch, any time you want. A simple way to create chords from any scale. Which means, you’ll be able to play the “right” chord progression, even if you don’t have tabs or sheet music. 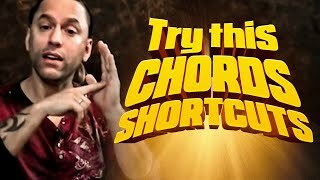 How to use chord expansions in the “real world.” So you can get creative with your chord progressions using simple techniques that sound great. Discover how the CAGED system works, and why it works so well, so you can play chords anywhere on the fretboard. Find out how to apply the CAGED system in real world playing situations. 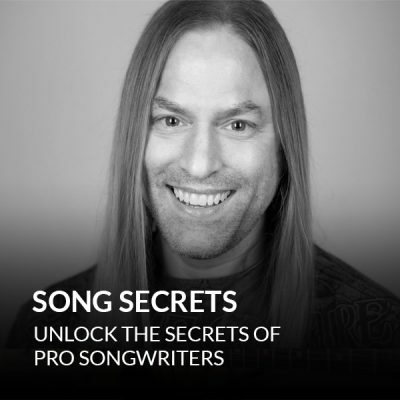 Which means, you’ll use chord fragments to spice up chord progressions on-the-fly. Easily play any chord you need to play, anywhere on the fretboard… even if you haven’t memorized all the positions. 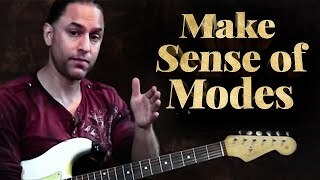 All about modes: what each mode sounds like, and how they’re used. Which means, no matter what song you hear, you’ll instantly know what to play. Simple shortcuts for understanding which chords are best for each mode, so you can create songs that sound the way you want them to sound. A quick and easy way to choose the right mode every time. Which means, you’ll never hit a bad note when you’re soloing. An easy explanation of intervals, and the pattern these intervals make between strings, so you can find the right notes without thinking. I began this course last week and could not believe how extremely EASY and understandable theory is. One of Steve's messages that he drives home to students is visualization. I am currently on module 3 and have never had so much fun in learning what I believed to be something difficult to understand. I had my first 'ah-ha' moment just today going through module 2 and the Circle of Fifths. The problem with two other theory classes that I took was the rushing through the lessons and not being able to absorb the instructions. That's the thing with Steve and GuitarZoom, don't rush, be a sponge! I'm really looking forward to the rest of the course and moving onto Solofire! Listen everyone, no one has to give me a freakin' thing to be honest. THIS STUFF WORKS AND IF I CAN ACHIEVE AN UNDERSTANDING OF THEORY, SO CAN YOU!! A step-by-step, logical, clear approach to music theory and its application to the guitar. This course is more evidence that Steve Stine is the best there is. Very clearly presented and useful. It is a shame that you can't download his courses and watch them when you are offline as I frequently am. If you are serious about really wanting to learn guitar, how to figure out songs you want to play, or even if you are a teacher wanting to help yourself and your students, this is the course to buy. I can not say enough good about the man Steve Stine, his character, his wisdom, and teaching abilities. I have spent several thousand dollars over a 51 year career at playing guitar on various learning techniques, lessons, and materials, I have even recently paid for a semester at one of the highest rated school of music universities that some of the most famous musicians and singers attend. If you sign up for an internet course, the school will email various videos and cord diagrams and tell you to submit a video of you playing the songs, the advertised instructor didn't even grade the work, it was someone I had never even heard of. You will never get as much wisdom and knowledge from that school as you can get from Steve Stine and this course for a tenth of what the school cost. Please do not hesitate if you really are wanting to seriously learn guitar, I promise you will not be disappointed and you will find you can always go back over this course and discover something to help you or your students or friends become a better guitar player and song writer. Thank you. I wish this was around when I was 18. Probably would have continued playing. Now that I'm in my 50's I decided to do it right. Finding Steve was a god send. He makes all his courses easy to understand and this one is no exception. I'm taking my time and am about half way through and the course is awesome! Very helpful course. If I had persevered with my piano lessons age 9 I would have got all this stuff then & my musical abilities would have blossomed early & been very different. So here I am 60 years later finding out what it all means. As the light goes on in my brain I can see the way forward. Steve is not just an awesome guitar player, he is a brilliant teacher and simplifies things and makes it easier to understand. A great course to help you understand the why as well as the how of music; not just guitar. I learned more about how the chords are constructed, how the scales are developed and some neat tricks about triads. This will make both soloing and rhythm guitar easier and more intuitive. I have purchased a lot of Steve ( and Dan's) products over time. I have never been disappointed with any of the products. I try not to purchase duplicate content, but Steve is so keen, there seems to be constant evolution of the products. 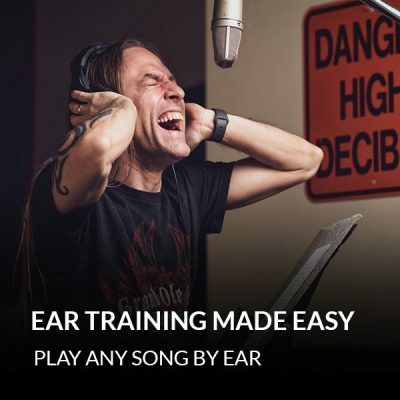 Too often life gets in the way, which leaves me not a very accomplished guitarist, but with the coaxing and insight of these instructors, products, webinars, members, Facebook, etc. I happily persevere. The frustrations of learning something new, cause me now to believe the journey is the destination. The reason why I never have attempted to write a review, is that I may turn it into a testimonial. Music Theory Made Easy is one of Steves' products that is the cornerstone of my journey. Ok, a little background. I got my first guitar about 40 years ago. I took a few lessons and found out I just hadn't gotten any better after six months or so, and put the guitar in the closet. Fast forward about 20 years when I started up again, a lot more seriously. I struggled and stumbled my way through the basic chords, then barre chords, and then hit the wall. After watching a load of videos from about four different instructors, I made the leap and purchased Music Theory Made Easy. I think the title is a misnomer. It is music theory, but it isn't easy, the teacher just makes it seem easier. The video instruction backed up with the manual, and a lot of work on my part, brought me to another level Understanding the theory and following it up with lots of practice has driven me to learn more and more. All this and I'm only 32% of the way through the course. I am moving all over the fretboard through the major and natural minor scales, as well as both pentatonics. Believe me, if anyone out there who is in the same boat as I was, invest in this course!!! If you are at all serious about learning to play, do it now. Thanks to Steve, Dan, and the Support Team at GuitarZoom. Steve assures us that understanding the theory behind what we do on the guitar makes us better with the instrument. By the end of this course, I could see why. I have taken theory courses that used the piano to demonstrate how it works, but applying theory to the guitar is quite different--as Steve puts it, like having six pianos all lined up. The course's modular (bite-sized) segments that are clearly labeled make it easy to target precisely those things on which I need refreshers. This is a course I will revisit many times, so I am glad to have it in my list of courses on GuitarZoom. I recommend it for anyone who wishes to demystify how music theory applies to the guitar. I learned why I was doing a lot of what I was already doing. I also learned how to learn different things by knowing how the scales and chords from a major scale worked. This was very helpful. Should have learned more theory years ago. Tons of great stuff to learn and then apply to playing. There are things I learned in this course that I didn't know how to apply. This was and is primarily based on my inexperience and a lack of actual playing experience. This is by far my favorite course of these three because with it I am immediately applying the information to my playing. For me, this is the exact course I should have started with. However, since I did this one last I'm glad because I may not have gone through the other two (and quite a few others). I'm including these comments in every review of the three courses to say that while I may have learned a fact in the theory course I didn't really know what to do with it. Then the "secrets" course completed that little void in my thinking and I am using that fact. And, I understand how to apply many other pieces of info that were lost in my world of in-experience. Having already completing the theory course I understood and was already ahead of some info even though Steve covers these facts (I-IV-V progression for example) in almost every course I've gone through. Personally, I think a package deal of these three courses is a good idea. This course is so well structured and easy to follow. Steve explains everything in a clear concise manner. I would recommend this course to anyone learning to play the guitar whether or not you really want to understand theory fundamentals. Steve is a great teacher. He makes music theory not only understandable, but easy to incorporate into your playing. This course is worth the money if you want to understand why you play what you play. Theory is necessary, but often difficult to retain. 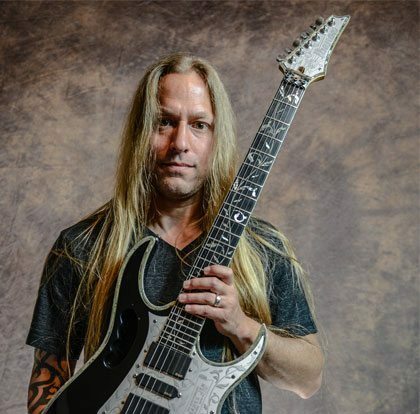 Steve makes this a simple process and adds knowledge to any guitarist in his/her journey. Get this course. I have other courses than Music Theory by Steve . I like the way he teaches . I would recommend this course to any one wonting to learn theory . I would rate this one a 10 . I'm learning thing I never would have guessed. If I have any problem at all with this course, it's that I keep learning things that help me to be able to understand something I've struggle with for a lifetime and then I go off on a tangent exploring what I just learned. As you might have guessed, I'm being sarcastic. That's not a bad thing and Steve even says to NOT try to rush through the course, but give yourself time to absorb what you learn. I've had the course for a little while now and I'm still only just at the end of the 3rd module. There is so much to explore once my eyes were opened. I'm definitely getting my money's worth. Over 30 years I thought that its not necessary to know something about music theory. A great mistake. Thank you Steve for this very well explained stuff. I love the course l keep reviewing it so I can retain the information. Thank you again Steve. This music theory course contains an enormous amount of valuable information that Steve Stein, among other things makes this course a fun learning experience. With the information in this course and Steve’s teaching has expanded my understanding of the guitar and expanded my playing by not being boxed in by the “rules”. As a beginning guitarists, like myself it is more than worth the cost of the course. Out of a scale of 1 to 10 (pun intended) I would give it a 10 and I would highly recommend it to anyone pursuing excellence in playing guitar no matter what genera of music you like. This an excellent course from an excellent teacher if you want to dig in to music theory. The course of music theory that Steve teaches, simplafies what it means ! I am now understanding what music theory for the guitar is. Just want to say thx! I'm playing guitar for years and never felt like this before. Your theory course is amazing! It's really important to explore and understand the guitar. I'm impressed with Steve's ability to explain things so that even an old knuckle dragger understands them. I've decided not knowing theory and playing music is like flying an airplane and having no idea why it flies. It is easy when Steve explains it! Thebest part is if you need to review it' always there. I always wanted to understand the theory part because I felt I was missing something when it came to understanding what I was doing on the guitar. Playing chords are one thing but when you know how the chords are made and how the progression works for each chord it's amazing! I'm still learning but wow is this a great course to have in the library! I keep referring back to sections all the time and I'm getting better each day. Can't say thank you enough for the help Steve and Dan! I used to take piano classes; and although it was always more practical than theoretical, I picked up "the basics." I understood scales, and key signatures, major and minor. I thought I "knew music theory," at least in general. 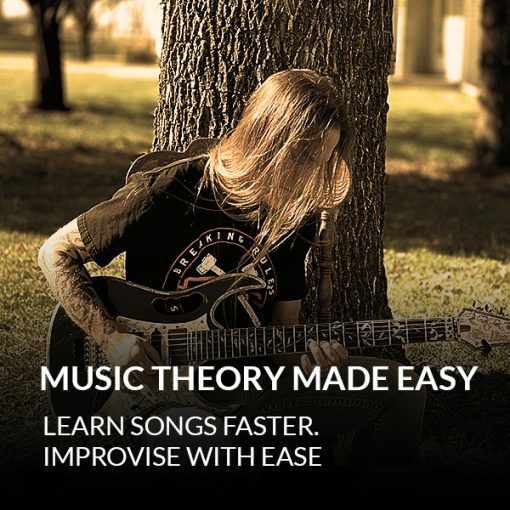 "Music Theory Made Easy" covers all that, but that's just getting started. I've taught myself scales on the guitar fretboard, but Steve's clear and thorough explanations of intervals made more sense than anything I'd ever heard before. I've read books about CAGED, and while the principle seemed promising, I never really "got" how to apply it: Steve just put it into perspective so it makes sense. Modes, which always seemed like exotic and esoteric concepts; now make sense. This really is "music theory" and it really is "made easy" -- and fun, despite being incredibly dense with details. (And, hey, you take it at your own pace and rewind as much as you want; what more could you ask?) This is more than just a great class from Steve; it's an epiphany.